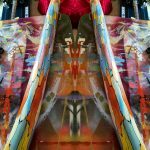 Mitchell Griest, a studio art major in the Department of Art and Art History, has teamed up with another UA undergrad, William MacGavin, who makes didgeridoos, to paint several of the musical instruments for the upcoming 44th Kentuck Festival of the Arts. 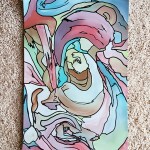 An undergrad double major in computer science and studio art with a minor in math, Griest is painting MacGavin’s handcrafted instruments in the bright and energetic abstract colors that Griest uses in his paintings, murals and other art work. 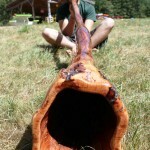 MacGavin, a junior at UA studying architectural engineering en route to an MBA through the STEM program, has been making didgeridoos, a wind instrument developed by Indigenous Australians, since high school. 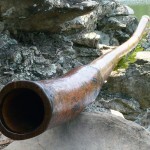 He carves his didgeridoos from the large dried yucca plants that grow in his native southern California. The didgeridoos painted by Griest, and more styles made by MacGavin, will be at booth G-06, “Didgeridoos by William MacGavin,” at the 44th Kentuck Festival of the Arts in Northport this weekend. More about the festival is here: http://www.kentuck.org/the-festival/. Griest plans to graduate in August 2016 with a Bachelors of Science in Computer Science, a Bachelors of Arts in Studio Art, and a minor in Mathematics. He works part-time at the Sanford Media Center in Gorgas Library, where he helps other students use multimedia equipment (cameras, microphones, lights, etc) and software such as Adobe Creative Cloud to create multi-media projects. He also offers consultations in digital sound production in SMC’s recording studio and is helping to form a music production group for UA students.